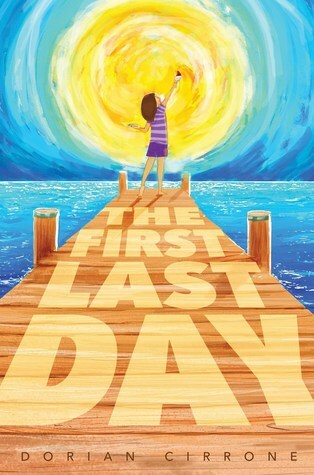 Haleigh and her friend Kevin are enjoying the last day before middle school doing all of their favorite things, but it ends badly; Kevin's grandmother, G-Mags, has a stroke. The next morning, however, Kevin isn't sleeping on Haleigh's couch, and her mother denies that anything like that happened. It's still the last day of summer vacation, and Haleigh has to figure out how that happened. She narrows it down to a paint kit, and a picture that she has made, wishing for things to continue as they are. After the day continues for a long time (at one points, 60 days was the figure mentioned), Haleigh is tired of it. She finds out that there are things in the future that she would like to see happen, and is determined to find out where the paintbox came from and how to reverse the wish, even if it means things change. Strengths: Losing a grandparent is a reasonable sad thing to have in a middle grade novel, and Haleigh does have very supportive parents, as does Kevin. This is convincingly told, and the time loop/wish fulfillment feature works well. Weaknesses: The time loop isn't exactly fresh-- Christmas Every Day by William Dean Howells was published in 1892, and there are movies like Groundhog Day that cover the same idea. However, I can't think of any time loop novels in my library, and my students may not be familiar with the trope. What I really think: Debating. This is closer to the magical realism books that do decently well in my library than to the time travel books I like, but the cover isn't great and it might be a bit of a hard sell.